Got a question about buying Diamonds? Buying a diamond can be daunting. With greater knowledge you should get a better diamond for your budget. Read our helpful tips and guides or contact us directly for a free personal service. By asking the right questions, you'll end up getting a much better diamond for your budget. Contact the Guru today and he will help you source the perfect diamond for your engagement ring. 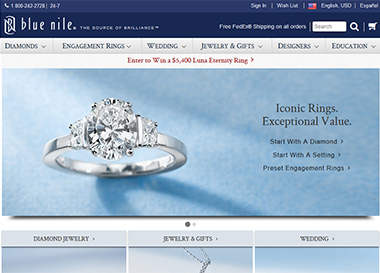 Blue Nile is one of the best known online jewelry retailers. With net sales reported in 2015 of US$ 473 million it’s fair to say they are a popular, but are they the right choice for you? 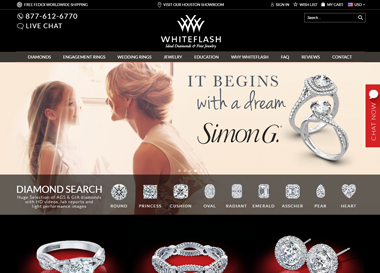 Whiteflash has the best selection of high quality designer rings. They specialise in round Hearts and Arrows plus Princess cut diamond rings and provide excellent customer service. 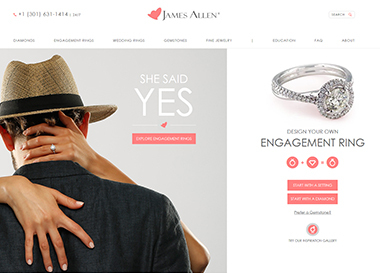 James Allen has become one of the most popular choices for many people looking for a unique diamond engagement, especially for fancy shape diamonds. I am diamond enthusiast Richard Jenkins, the man behind Your Diamond Guru. I’ve invested many years studying diamonds, settings and where to buy them from. My interested in diamonds developed when I was looking for a diamond engagement ring for my fiancé many years ago. 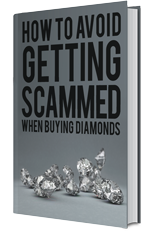 After initially reading an article about the 4c’s this lead to the purchase of many books about diamonds. Not long after purchasing a beautiful diamond ring for my fiancé I became the go to person for friends, family and even friends of friends for tips and advice on buying diamonds for engagement rings. The majority of men tend to focus on the size of the diamond because they assume that the bigger the diamond is, the great the impact. Unfortunately, this isn’t always the case. There are so many different factors that should be taken into consideration when selecting a diamond. All the information that you need is published on this site, but if you are unsure or have any question, feel free to contact me directly. Helping people is something that I enjoy and that is why I decided to launch the Your Diamond Guru website, so that I could spread my reach and help more people get a better diamond for their budget. A big thank you to Richard, he was very patient answering all my questions and running through the 4Cs. He put me in touch with two companies and helped me choose the best diamond for my budget - he also helped with the Setting. My fiance absolutely loves the ring and of course said Yes. Thanks again Rich!! Richard was more than helpful running over the 4Cs in great detail and helping me select the perfect diamond and setting. I highly recommend him. I just wanted to say than you Richard for helping me find the perfect engagement ring for my fiance. I was a bit overwhelmed when I first started looking. With your help and guidance I ended up finding a lovely diamond ring. Thanks for responding to all of my questions and for pointing me in the right direction. You were a great help!